The brain is the center of the nervous system in all vertebrate and most invertebrate animals. From a philosophical point of view, what makes the brain special in comparison to other organs is that it forms the physical structure that generates the mind. Through much of history, the mind was thought to be separate from the brain. Even for present-day neuroscience, the mechanisms by which human brain activity gives rise to consciousness and thought remain very challenging to understand: despite rapid scientific progress, much about how the human brain works remains a mystery. The operations of individual brain cells are now understood in considerable detail, but the way they cooperate in ensembles of millions has been very difficult to decipher. The cerebrum, or telencephalon (Grosshirn, cerveau), that fills up most of the skull, is involved in cognition and also controls movement. The cerebellum, or little brain (Kleinhirn, cervelet), that sits at the back of the head, under the cerebrum, controls coordination and balance. The brainstem (Hirnstamm, tronc cérébral), that sits beneath the cerebrum in front of the cerebellum, connects the brain to the spinal cord and controls automatic functions such as breathing, digestion, heart rate and blood pressure. The human brain is divided into right and left halves (hemispheres). The left half controls movement on the body’s right side. The right half controls the body’s left side. In most people, the language area is mainly on the left. Preserved brains have a grey color, hence the name grey matter. The brain’s wrinkled surface is a specialized outer layer of the cerebrum, called the cerebral cortex (what we see when we look at the brain). Each bump on the surface of the human brain is known as a gyrus, while each groove is known as a sulcus. In a typical human the cerebral cortex is estimated to contain 15–33 billion neurons, each connected by synapses to several thousand other neurons. These neurons communicate with one another by means of long protoplasmic fibers called axons, which carry trains of signal pulses called action potentials to distant parts of the brain or body targeting specific recipient cells.. The Terminologia Anatomica (TA), the international standard on human anatomic terminology, developed by the Federative Committee on Anatomical Terminology (FCAT) and the International Federation of Associations of Anatomists (IFAA), released in 1998, defines two additional lobes : The limbic lobe, associated to emotion and memory and the insular cortex, associated to pain and some other senses. The frontal lobe is associated with reasoning, motor skills, higher level cognition, and expressive language. The parietal lobe is associated with processing tactile sensory information such as pressure, touch, and pain. 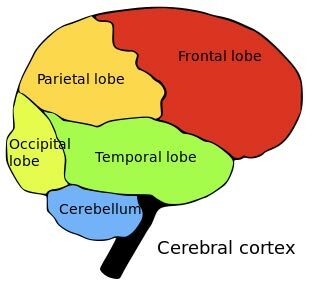 The temporal lobe is the location of the primary auditory cortex, which is important for interpreting sounds and the language we hear. The hippocampus is also located in the temporal lobe, which is why this portion of the brain is heavily associated with the formation of memories. The occipital lobe is associated with interpreting visual stimuli and information. The primary visual cortex, which receives and interprets information from the retinas of the eyes, is located in the occipital lobe. The brainstem is comprised of the hindbrain (rhombencephalon) and midbrain. 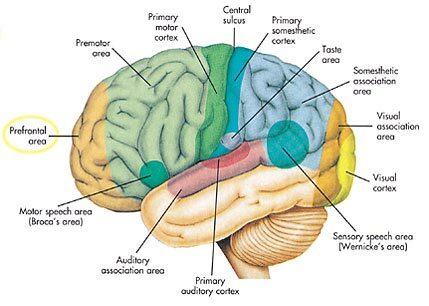 The hindbrain contains structures including medulla oblongata, the pons and the reticular formation. The limbic system contains glands which help relay emotions. Many hormonal responses that the body generates are initiated in this area. The limbic system includes the amygdala, hippocampus, hypothalamus and thalamus. Great progresses in the analysis which parts of the brain are involved in a particular mental process have been made in the last years with the functional magnetic resonance imaging (fMRI). A biological neuron (nerve cell) is an electrically excitable cell that processes and transmits information through electrical and chemical signals. A chemical signal occurs via a synapse, a specialized connection with other cells. Neurons connect to each other to form neural networks. Neurons are the core components of the nervous system, which includes the brain, spinal cord, and peripheral ganglia. There are different types of neurons: sensory neurons, motor neurons and interneurons. A typical neuron possesses a soma (perkaryon or cyton = cell body with nucleus), dendrites and an axon. Neurons do not undergo cell division. Dendrites are thin structures that arise from the cell body, branching multiple times and giving rise to a complex dendritic tree. An axon is a special cellular extension that arises from the cell body and travels for long distances (as far as 1 meter in humans). 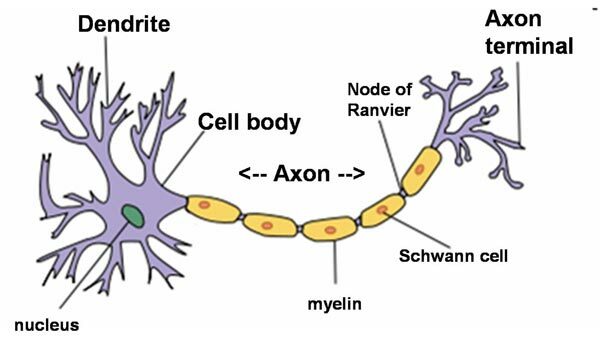 The cell body of a neuron gives rise to multiple dendrites, but never to more than one axon, although the axon may branch hundreds of times before it terminates. The axon terminal contains synapses, specialized structures where neurotransmitter chemicals are released to communicate with target neurons. At the majority of synapses, signals are sent from the axon of one neuron to a dendrite of another, however there are a lot of exceptions. 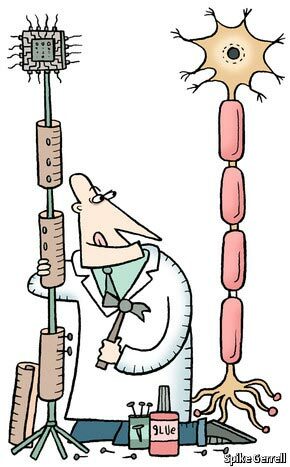 All neurons are electrically excitable, maintaining voltage gradients across their membranes by means of metabolically driven ion (sodium, potassium, chloride, calcium) pumps. Changes in the cross-membrane voltage can alter the function of voltage-dependent ion channels. 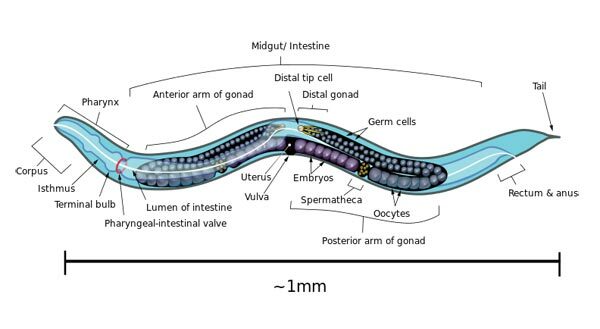 Each time the electrical potential inside the soma reaches a certain threshold, an all-or-none electrochemical pulse called an action potential is fired, which travels rapidly along the cell’s axon, and activates synaptic connections with other cells when it arrives. An artificial neuron is a mathematical function conceived as an abstraction of biological neurons. The artificial neuron receives one or more inputs (representing the dendrites) and sums them to produce an output (representing the axon). Usually the sums of each node are weighted, and the sum is passed through a non-linear function known as an activation function or transfer function. The first artificial neuron was the Threshold Logic Unit (TLU) first proposed by Warren McCulloch and Walter Pitts in 1943. This model is still the standard of reference in the field of neural networks and called a McCulloch–Pitts neuron. However, artificial neurons of simple types, such as the McCulloch–Pitts model, are sometimes characterized as caricature models, in that they are intended to reflect one or more neurophysiological observations, but without regard to realism. In the 1980s computer scientist Carver Mead, who is widely regarded as the father of neuromorphic computing, demonstrated that sub-threshold CMOS circuits behave in a similar way to the ion-channel proteins in cell membranes. Ion channels, which shuttle electrically charged sodium and potassium atoms into and out of cells, are responsible for creating action potentials. Using sub-threshold domains mimicks action potentials with little power consumption. At the Neuromorphic Cognitive Systems Institute of Neuroinformatics of the University of Zurich and ETH Zurich, a research group leaded by Giacomo Indiveri is currently developing, using the sub-threshold-domain principle, neuromorphic chips that have hundreds of artificial neurons and thousands of synapses between those neurons. Neuromorphic computing is a concept developed by Carver Mead, describing the use of very-large-scale integration (VLSI) systems containing electronic analog circuits to mimic neuro-biological architectures present in the nervous system. Carver Mead is a key pioneer of modern microelectronics. Today the term neuromorphic is used to describe analog, digital, and mixed-mode analog/digital VLSI and software systems that implement models of neural systems. Neuromorphic computing is a new interdisciplinary discipline that takes inspiration from biology, physics, mathematics, computer science and engineering to design artificial neural systems and autonomous robots, whose physical architecture and design principles are based on those of biological nervous systems. An important property of a real brain is that each neuron has tens of thousands of synaptic connections with other neurons, which form a sort of small-world network. Many neuromorphic chips use what is called a cross-bar architecture, a dense grid of wires, each of which is connected to a neuron at the periphery of the grid, to create this small-world network. Other chips employs what is called synaptic time multiplexing. The Economist published a few days ago a great article “Neuromorphic computing – The machine of a new soul” with illustrations from the London-based illustrator Spike Gerrell. Functional MRI (fMRI) is a magnetic resonance imaging procedure that measures brain activity by detecting associated changes in blood flow. This technique relies on the fact that cerebral blood flow and neuronal activation are coupled. Since the early 1990s, fMRI has come to dominate brain mapping research. The primary form of fMRI uses the blood-oxygen-level-dependent (BOLD) contrast discovered by Seiji Ogawa at the AT&T Bell labs. fMRI is used both in the research world (cognitive neuroscience, cognitive psychology, neuropsychology, and social neuroscience), and to a lesser extent, in the clinical world. 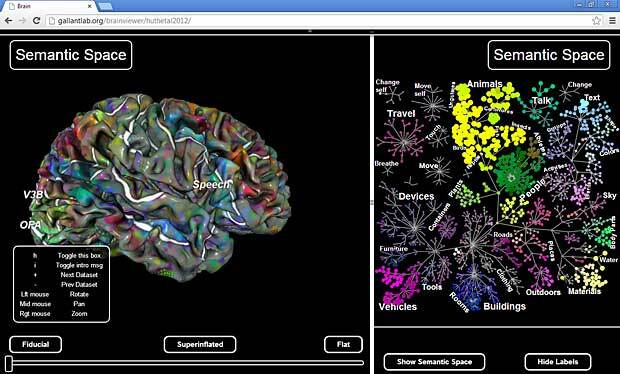 The Gallant Lab provides free access to several publications, links to websites and tools of the lab and a WebGL brain viewer. Neuroscience is the scientific study of the nervous system, mainly the brain. In the past neuroscience has been seen as a branch of biology. Today it is an interdisciplinary science that collaborates with other fields such as chemistry, computer science, engineering, linguistics, mathematics, medicine, philosophy, physics, and psychology. Recent theoretical advances in neuroscience have been aided by the study of neural networks. A public education booklet about the brain and neuroscience has been published by the IBRO. 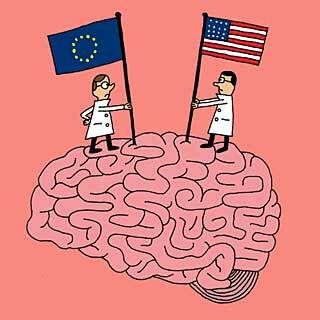 NEUROPOLIS will establish an institute of international stature. Like CERN in the field of physics, NEUROPOLIS unites neuroscientists and biologists from around the world. The initiator of the project is Henry Markram, the Director of the Human Brain Project at EPFL. NEUROPOLIS will also be open to the general public : an interactive space will be dedicated to neuroscience and the conquest of the brain. A video about the project is available at Dailymotion. Another famous medical research organization, dedicated to accelerating the understanding of how the human brain works, is the Allen Institute for Brain Science. This Seattle-based nonprofit institute was launched in 2003 by Paul Allen, the co-founder, with Bill Gates, of Microsoft Corporation. The Allen Institute for Brain Science provides researchers and educators with a variety of unique online public resources for exploring the nervous system, which are all openly accessible via the Allen Brain Atlas data portal. 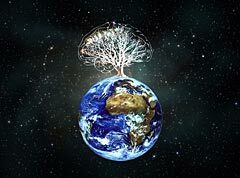 The global brain is a metaphor for the worldwide intelligent network formed by all the individuals of this planet, together with the information and communication technologies that connect them into a self-organizing whole. Although the underlying ideas are much older, the term was coined in 1982 by Peter Russell in his book The Global Brain. These perspectives now appear to come together into a single conception. In 1996, Francis Heylighen and Ben Goertzel founded the Global Brain Group, a discussion forum grouping most of the researchers that had been working on the subject to further investigate this phenomenon. The group organized the first international conference on the topic in 2001. In January 2012, the Global Brain Institute (GBI) was founded at the Vrije Universiteit Brussel to develop a mathematical theory of the brainlike propagation of information across the Internet. The GBI grew out of the Global Brain Group and the Evolution, Complexity and Cognition research group (ECCO). Guile 3D Studio, a company founded in 2001 by System Analyst, Artificial Intelligence Specialist and 3D Graphic Artist Guile Lindroth, created the advanced Virtual Assistant Denise. She comes with a real-time proprietary graphic engine, a high quality English Text to speech voice and a Voice Recognition engine. Denise works with an adaptive Artificial Intelligence Brain, based on AIML, that can learn by itself and be customized by user. Denise was the winner of the Chatterbox Challenge 2011 in the category Best New Bot. In 2014 Denise was the winner of the 1st place in the Chatterbox Challenge.. In september 2011, Guile 3D teamed up with NeuroSky for a brainwave impulse control interface. The NeuroSky MindWave headset is the first product available for the consumer market. As a turnkey brainwave sensing headset, it uses the same bio-sensor as the Mattel MindFlex, Star Wars Force Trainer and NeuroSky’s research tool the MindSet. It measures brainwave impulses from the forehead from a position neuroscientists call FP1 with research grade precision. In the same month, Guile 3D teamed up with EMOTIV for computer-brain control interface. Based on the latest developments in neuro-technology, Emotiv has developed a revolutionary new personal interface for human computer interaction. In 2013 an Avatar Builder SDK was announced which was however never released up to now. In January 2014, Guile 3D Studio became NextOS. The company will now focus in the Home Automation area as well improve the Virtual Assistant Technology. In April 2014 NextOS stopped for a while the work on the desktop version Denise 2.0 to get the Home Automation and the mobile modules ready. Late May 2014, NextOS started an Alpha testing phase for Virtual Denise Mobile on iOS, Android and Windows Phone 8 platforms. For this purpose NextOS uses both TestFlight, a free platform to distribute beta and internal iOS applications to team members and .